Spinnakers Cottage is situated in an enviable position right on the Pendennis marina in Falmouth, giving it marvellous views. 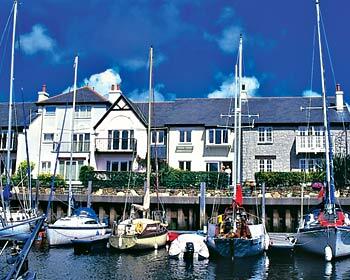 It is within a quarter of a mile from the centre of Falmouth, Pendennis Castle and one of four local sandy beaches. There are many more fine beaches, wonderful gardens and many indoor and outdoor activities in the area, as well as shops, restaurants and pubs. 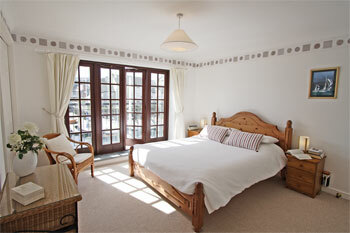 The cottage is comfortable and consists of three bedrooms, sleeping up to 5 adults and 1 child. Additionally, a travel cot can be provided for babies. Three bedrooms. Spacious sitting room with patio doors to terrace, gas 'coal effect' fire and dining area. Well equipped kitchen with breakfast area. First floor: Double bedroom with 5' bed, balcony and ensuite bathroom/W.C. (shower over bath). Twin bedded room. Single bedroom. Bathroom/W.C. (shower over bath).